Your tryst with Indian culture, heritage, religion & lifestyle, begins with us at Travel Bureau. Our core specialization is creating personalized & experiential tourism through our flagship India Experiencer™ tour packages. Our belief is that India is not just about the destination; it's about living the experience. Established in 1979, we have been hosting travellers from the world over. Our expertise has emerged through valuable interactions with guests and by building relationships over the past 30 years. With sheer focus on individual needs, we customize tour itineraries, providing ground transport, tour escorts, language guides, organizing rail, air & hotel bookings. Today, we feel privileged to be regarded as India's largest sub-travel agency network. Headquartered out of Agra, we have country wide offices in Gwalior, Jhansi, Khajuraho, Kolkata, New Delhi and Varanasi. 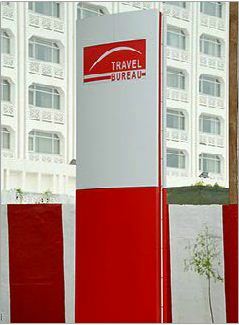 Travel Bureau exclusively operates the travel desk at the 5-star deluxe Hotel Jaypee Palace and Convention Centre in Agra. Our endeavour towards quality & excellence have made us the 'preferred' and most entrusted travel partner for many global and Indian tour operators. Our high standards in hospitality have enabled us to host over one million foreign individual travellers and manage over 1500 large conferences and conventions. We are fortunate to enjoy continued patronage of our guests during their repeat visits to India. Our Patrons comprise several eminent guests including, over 50 Presidents, Prime Ministers and Diplomats of various countries, such as President Clinton and his convoy, and late Princess Diana. Hollywood stars like Harisson Ford, Brad Pitt, Angelina Jolie and Bollywood celebrities like Aishwarya Rai Bachchan, Hema Malini, Anupam Kher have experienced our hospitality during their stay. An array of sportsmen, including the England Cricket team & CWG 2010 delegates have availed of our services during their India trips. Our logistics expertise has enabled us to work closely with top film and television production crews, managing entire movement & ground support for shoots by National Geographic Channel, BBC to name a few.